FOSSEE works on promotion and development of free and open source software in education. 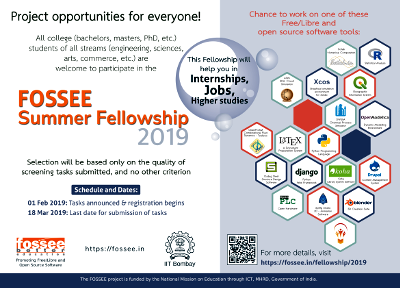 In view of large number of requests received from applicants, the last date for "FOSSEE Summer Fellowship 2019" registration and task submission has been extended till 31st March 2019. If you have requested to be enrolled into a FOSSEE course, you must wait for about 30 min before you can see the course on your dashboard.